The performance of this video editor is crazy ! I can insert 3 (or more) video tracks playing videos add a little alpha/transparency and many effects color lenses etc and the preview is smooth as hell and on the fly . My humble pc specs is a low spec Amd a12 quadcore processor 4.2ghz and intergrated r7 gpu of this processor. On my friend’s computer with much higher specs and an expensive 1060 nvidia on adobe premiere/after effects he can’t preview even a single video ,if you add another with transparency he can’t even preview it on lowest settings 1/8 and even there he got maximum 1fps lol . Thanks. Did you turn on the hidden GPU Effects to get this good impression? Most people complain about the performance. No i downloaded it from snap packages i see no secret option can you help me with that ? I remember it used to have an option before but now i can’t see it anymore in the new releases. The GPU effects feature is removed since November, 2018 because it was unstable on many people’s computers and it was burdensome to support. But if you were using that mode on an older version, that could explain the performance. We hope to re-enable the GPU effects feature in the future after other features are more mature. Could you elaborate more on this, @brian? I understand that getting GPU capabilities is very difficult but what is exactly holding the development of fully functional GPU in Shotcut? Is it that more hands would be needed in the mix to get it going? Is it that there are missing components that still need to be included for GPU capabilities? Is it that it’s simply such a project would be very time consuming so focus on that would take away from other areas of development? I figure that that to get fully functional GPU capabilities in Shotcut would involve heavy redevelopment of mlt first then Shotcut, right? I’m using the version 19.02.28 how is that fast if it has no gpu acceleration ? Anyway is there any way i can enable gpu acceleration ?? You can enable GPU in the shotcut.conf file. Use at your own risk. Could you elaborate more on this, @brian? MLT has a framework for GPU effects processing. 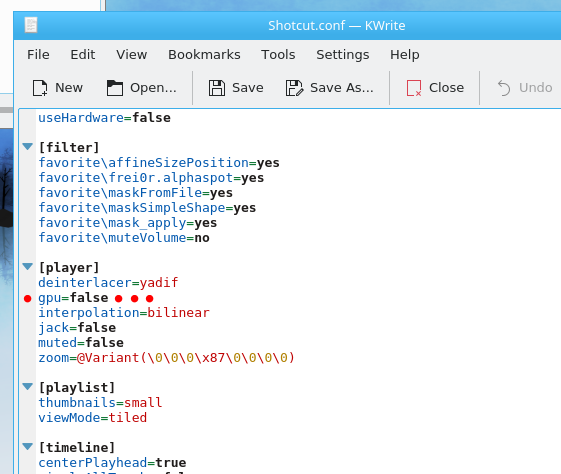 That framework is already implemented/in use in Shotcut. The problem is system compatibility. From past experience, we had seen that many users would have problems with crashing that we could not reproduce on our systems. So users become dissatisfied and frustrated and we can’t do much to help them. It is really just a matter of priority. From past experience, we had seen that many users would have problems with crashing that we could not reproduce on our systems. So users become dissatisfied and frustrated and we can’t do much to help them. That’s interesting. I suppose this is why you would have to buy different hardware configurations so that all angles are covered? Or could it have been that the users who were report problems weren’t as detailed as they could’ve been to give steps on how to reproduce the problems? You see, I would argue that getting GPU processing fully functional is more important than anything on the roadmap. There’s certainly features I would love for Shotcut to support but the truth is that no matter what new features are added the glass ceiling of not having full GPU processing implemented is still going to be there and will keep holding Shotcut back. @shotcut has already noted right here that most people complain about Shotcut’s performance. Nowadays with editing demands being higher and footage like 2K, 4K and beyond becoming more commonplace, GPU processing is going to become the norm. I believe it’s best to get on that train sooner rather than later so as not to be left behind struggling to catch up. The upcoming Proxy feature is going to be fantastic but GPU processing would take Shotcut to a whole new level and make it an editing program to be taken seriously by everyone. I don’t know how other users on this forum feel (and maybe it could be taken to a vote) but I personally feel that after the Proxy feature and anything else that is right around the corner is implemented in Shotcut, there should be a pause on development of all other features so that a hyper focus can be set on GPU development. Therefore if several monthly updates have to be skipped or any official updates are just limited to bug fixes until GPU processing is finished then so be it. In the big picture it’d be a huge win and a breakthrough for Shotcut. My idea would be to go through a series of beta versions of Shotcut here on the forum solely focusing on GPU. So that would mean stage after stage of beta versions for however long it needs to go through before GPU processing is finally completed. We’ve already done more than half a year of beta testing on the forum before official releases were posted. I think they’ve gone reasonably well as they were key to making Shotcut more stable than it has been. This would be just a more concentrated and extended form of that kind of beta testing. A little of the second, but mostly the first. Hardware compatibility is the hardest part of using the GPU. My idea would be to go through a series of beta versions of Shotcut here on the forum solely focusing on GPU. All your suggestions are great from a user perspective. But from a contributor perspective, I find debugging GPU problems to be the least interesting and least rewarding work. I try to focus on contributions that are interesting and rewarding to me in order to keep my motivation high. To get past #1, we would need a contributor to emerge with the ability and will to fix it all up. Or maybe an existing contributor will suddenly find a renewed interest in it. Now it is even faster !!! Someone should create a video to compare adobe premiere/after effects preview speed with shotcut , you can’t even compare them ! Shotcut is smooth as hell ! -The only problem mlt hardware acceleration may have is with nvidia graphics cards , on amd graphics cards it works just fine. Please don’t remove this option from menu ! Re “if we had more opensource software like yours then everyone would ditch windows”. Whilst I applaud your enthusiasm, you show your bias. All my MAC friends say “As soon as you get to know a Mac you’ll love it.” But they are just showing their ignorance and their foolish belief that everybody will think just like them as soon they have been shown a Mac. I have been Windows for 25 years, Linux for 20 years, and Mac OS for about 10 years. All sytems have their strengths and their weaknesses, but I learned a long time ago that people will gravitate to whichever system works in the way that they think. There is no OS that will suit everybody’s needs. Of course linux isn’t perfect at least for games and those who learned some proprietary software like adobe or something else that doesn’t has a linux version. But the fact is that shotcut’s performance on linux on my specific computer can’t even be compared to other video editing applications on windows like adobe or sony vegas they can’t even preview a video with small or no effects while shotcut can handle everything i throw in it ! and have perfect smooth preview so i can actually create the video how i want it. If we had more software like this that would make more people to ditch windows. You make a very compelling case for using SHotwell on Linux. I will try it. And I love Linux too, but I need to use a proprietary CAD package that does not have an equal in the Linux world. I also use MS Excel because I can write some very useful macros in Excel’s Visual Basic for Applications. I have tried LibreOffice and it works well as a spreadsheet but it’s macro language is much harder to use than Microsoft’s VBA. I know Fortran IV, and GW-BASIC, and QBasic, so I find that VBA is quite intuitive and easy to write code in. I’m in the process of learning Python because that might free me up from some of my dependence on MSoft. I would love to drop Windows and move to Linux completely, but for now it’s just not possible. The argument about which OS is best will never die. It is as timeless as the question of which political party is best Democrats or Republicans (USA), Liberal or Labor (Aust), Conservatives or Labour (UK)? What is the path to access this configuration file in W10? I would like to try this on my computer. AFAIK the config info is in the registry. Thanks for the information, very kind. Unless you choose to set an app data directory in settings in which case it uses an ini file in there. You can try it yourself , if you are using for example premiere pro or after effects or sony vegas try to add 3 video tracks add 1080p videos on it, apply transparency 50% , apply different color effects and a lenses effects on each track and try to preview it .